May 5th 2011 | LIMA--THANKS to the cold Humboldt current, Peru's inshore waters are home to one of the world's greatest fisheries. Its keystone is the fast-growing anchoveta. Vast shoals of this member of the anchovy family feed on upswelling algae; they are themselves eaten by scores of other species of fish. For decades anchovetas have been ground into fishmeal, of which Peru is the world's top producer. They have suffered from rampant overfishing, whose effects are sometimes amplified by the disruptive El Niño and La Niña weather patterns. The annual catch peaked at 12m tonnes before the stock collapsed in 1972, taking years to recover. Now Peru is trying to make better use of one of its prime resources, in two ways. 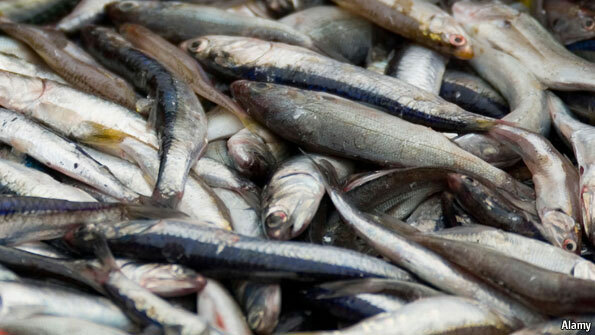 The government has introduced a quota aimed at ensuring that 5m tonnes of anchoveta are left each year as spawning stock. Since 2009 this has been refined so that the overall quota (set at 4.1m tonnes this year for the first of the two fishing seasons) is divided up among the country's 1,600 registered trawlers. Each boat's quota is transferable; the aim is to have a smaller, more efficient fleet. In January the minister of production, Jorge Villasante, ended the season with less than 35% of the quota caught because there were too many juveniles, he says. Management of the fishery has improved, concedes Patricia Majluf, a zoologist at Lima's Cayetano Heredia University, but she says there is still not enough information about stocks to know whether it is sustainable. At the same time, some in the fishing industry have realised that selling anchoveta as food for people, rather than as fertiliser or animal feed, is more profitable. Human consumption of anchoveta in Peru has risen from 10,000 tonnes in 2006 to 190,000 tonnes in 2010. Most of this is canned, like sardines. One fishing company, Inversiones Prisco, has begun to produce salted and cured anchovy fillets. They are smaller than the prized Mediterranean or Cantabrian anchovy. But supply is far more abundant. Prisco is already the world's "fifth or sixth" biggest exporter of anchovies, according to Hugo Vernal, its manager. It is investing $30m to double production. "It would be irrational to think that in ten years' time we will continue to allow a fish that could feed people to be ground up for farming," says Mr Vernal.